Thomas & Betts Superstrut® Cobra® 1-Piece Cable and pipe clamp of trade size 1-1/4-inches, is suitable for use with EMT, rigid conduit and cable to strut channels. 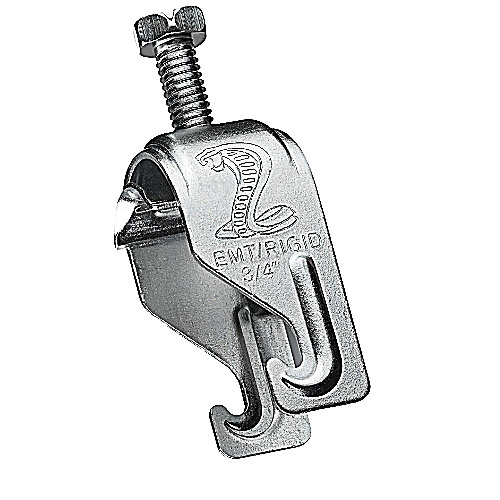 This clamp features steel construction and silver galvanized/electro-galvanized finish. Clamp has working limit of 200 lb static load 1, 50 lb design load 2 and load 3. The heavy-duty 5/16-Inch hex bolt with multi-driver head, Robertson square, Phillips cross-recess and slot, offers full range of installation options. It has parallel hook design that helps to keep conduits and cable square with strut. The universal bolt head accepts wide range of tools. It clamps about 1.4 - 1.725-Inch OD. Clamp is UL E160899 listed and CSA certified.